Loch Leven Castle island, where Mary, Queen of Scots was imprisoned in 1567. This table includes all of the freshwater islands that exceed 35 hectares (86 acres) in size and/or are populated. Inchlonaig and Inchcruin[Note 5] are classified by the National Records of Scotland as "inhabited islands but had no usual residents at the time of either the 2001 or 2011 censuses." It is likely that Contin Island and Eilean Aigas are inhabited, at least from time to time as well, although they were not listed as such by the Census in 2001 or 2011. Loch Awe is Scotland's longest loch and abounds with islands and crannógs. Several of the islands are, or have in the past, been inhabited; there are two castles and the remains of a chapel on the islands. Inistrynich, Eilean na Maodail, Eilean Dubh and Liever Island are all promontories as opposed to islands despite their names. The loch's water levels have fluctuated so some of them may have been islands in recent history, as the promontory on which Kilchurn Castle stands once was. There may be up to sixty islands in the Loch Lomond including Inchmurrin, the largest freshwater island anywhere in the Britain and Ireland, and Inchconnachan, which has hosted a small population of Red-necked Wallaby since at least 1975. 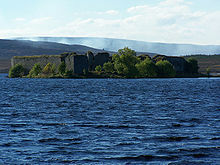 The isolated strongholds of Lochindorb Castle and Loch an Eilein Castle were once in the hands of the 14th century nobleman Alexander Stewart, the infamous "Wolf of Badenoch". There are numerous unnamed small islands in mainland lochs, including those where the water level has been artificially raised by the creation of dams for the production of hydro-electricity. This process has created new islands that would previously have been small eminences. There are relatively few genuine islands in the lochs of the Inner Hebrides, many of those that do exist being artificial crannógs. By contrast there are innumerable small islands in the estimated 7,500 lochs of the Eilean Siar, only a small proportion of which are named by the Ordnance Survey. The Orkney and Shetland archipelagos to the north are similarly lacking in freshwater islands. Law Ting Holm is the former location of the national þing, or Norse parliament of Shetland. No part of Scotland is more than 80.4 kilometres (50 mi) from the sea and as a result Scotland's rivers are neither very wide nor long (although Scotland has many substantial salt water estuaries called firths). These are islands in freshwater, or where indicated, occasionally reached by high tides and in brackish water. 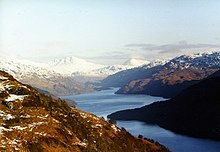 Wikimedia Commons has media related to Lochs of Scotland. Mugdrum Island, which lies in tidal waters in the Firth of Tay. General Register Office for Scotland (28 November 2003) Occasional Paper No 10: Statistics for Inhabited Islands. Retrieved 9 July 2007. Ordnance Survey (2009) "Get-a-map". Retrieved January 2010. 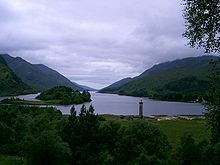 ^ "Loch" is a Scottish Gaelic word for both a lake and a fiord that has been borrowed by Scots and Scottish English to apply to such bodies of water. The Lake of Menteith is the only natural body of water called a "lake" in Scotland. ^ Some of the islets in Loch Lomond may only appear when the water levels are low and although many sources provide a figure of up to sixty islands this may derive from a poetic 9th century description. Other sources suggest a total of 30 or 38 islands. ^ Crannógs are excluded as they are both artificial and very numerous. There are at least 600 of these small prehistoric structures in Scotland. ^ There is a significant difference between the Ordnance Survey (OS) treatment of freshwater and offshore islands. See for example Loch Snigiscleit at grid reference NF802254. If the islands here were offshore it is virtually certain that there would be three substantial named islands and probably half a dozen named smaller ones. There are several examples – Loch Druidibeag has two named islands and about a dozen un-named. It is not clear whether this because the OS only chose to list a few larger ones and those identified by RCAHMS, or if for some reason local people did not give names to smaller islands in lochs. The latter is unlikely although these islands offer much less of threat to fishermen and thus there is less of an imperative to be aware of them. ^ As there are numerous lochs in Highland, which is large council area covering over 30,000 square kilometres (12,000 sq mi) the area committee designations of Badenoch and Strathspey, Caithness, Inverness, Lochaber, Nairn, Ross and Cromarty, Skye and Lochalsh and Sutherland are used to identify the location. ^ Numbers in brackets indicate that there are (2) or (3) islands of the same name in the body of water referred to. ^ The island of "St Mallo" is mentioned by Visit Dunkeld. ^ Eilean Mhuireill at the south end of the loch (grid reference NR386673) is identified by the Ordnance Survey as a crannog. ^ Dun Baravat has an Iron Age roundhouse dated from between 300 and 300 BC. ^ Rainish Eilean Mòr at grid reference NB388281 is about 27 hectares (67 acres) in extent. This makes it one of the larger freshwater islands, but it is probably the largest relative to the size of the body of water it sits in, Loch Orasaigh being only about 125 hectares (310 acres) all told. ^ Eilean nan Cnàmh is in Loch nam Faoileag, an arm of Loch Trealalabhal separated from the main body by a causeway. The former loch is "commonly regarded" as part of the latter. ^ This loch is not specifically named by the Ordnance Survey and at one time it may have been an extension of the saltwater Loch Boisdale. Its size has been enhanced artificially in that a small dam has been constructed, probably to prevent brackish water entering from Poll a' Fearchadh. ^ This islet is now attached to Mainland Shetland by a stone causeway. ^ (b) Indicates those that from time to time lie in brackish water, as indicated by the Ordnance Survey as lying below the "Mean High Water Springs". ^ Canny Island at NT891467 is in the middle of the Tweed but on the English side of the border as identified by the Ordnance Survey. Likewise Dreeper Island, further upstream. ^ a b "Botanical survey of Scottish freshwater lochs" Archived 2016-03-03 at the Wayback Machine Archived 2016-03-03 at the Wayback Machine SNH Information and Advisory Note Number 4. Retrieved 1 January 2010. ^ "Inchmahome Priory" Archived 2010-04-07 at the Wayback Machine Mysterious Britain. Retrieved 26 April 2010. ^ "Lochindorb Castle" Canmore. Retrieved 28 April 2010. ^ "Inchmahome Priory" Historic Scotland. Retrieved 28 April 2010. ^ "Loch Lomond Islands – Inchmurrin". Loch Lomond.net. Archived from the original on September 28, 2007. Retrieved 23 August 2007. ^ "Loch Lomond Islands" Archived 2009-11-18 at the Wayback Machine loch-lomond.me.uk. Retrieved 23 January 2010. ^ For example, "Loch lomond" Archived 2011-07-22 at the Wayback Machine Archived 2011-07-22 at the Wayback Machine goxplore.net Retrieved 29 April 2010. ^ "The Loch" Loch Lomond.net. Retrieved 23 January 2010. ^ For example, Haswell-Smith (2004) pp. 96, 104, 375. ^ Fellows-Jensen, Gillian "On dalr and holmr in the place-names of Britain" Ramsdale.org. Retrieved 29 April 2010. ^ "Crannogs" BBC. Retrieved 23 January 2010. ^ Estimates based on Ordnance Survey maps and General Register Office for Scotland statistics unless otherwise stated. ^ a b c d e f g h i Rick Livingstone’s Tables of the Islands of Scotland (pdf) Argyll Yacht Charters. Retrieved 12 Dec 2011. ^ See Ordnance Survey maps at for example NN073220 and NN102247. ^ Coventry (2008) p. 78. ^ "Loch Lomond Islands: Inchconnachan". Loch Lomond.net. Archived from the original on June 9, 2009. Retrieved 25 April 2010. ^ Welch, D.; Carss, D.N. ; Gornall, J.; Manchester, S.J. ; Marquiss, M.; Preston, C. D.; Telfer, M.G. ; Arnold, H.R. ; Holbrook, J. (2001). "An Audit of Alien Species in Scotland. Review no 139". Perth: Scottish Natural Heritage. ^ Grant (1993) pp. 144–45. ^ "Loch an Eilein Castle" Gazetteer for Scotland. Retrieved 25 January 2010. ^ See for example Loch Benevean in Glen Affric at NH256267. ^ "Duke Murdoch's Castle (remains of)". Wikimapia quoting census records. Retrieved 29 July 2013. ^ a b "Thing" Shetlopedia. Retrieved 3 August 2010. ^ "Lewis, Great Bernera, Loch Baravat, Dun Baravat" Archived 2011-07-19 at the Wayback Machine Scotlandsplaces.gov.uk. Retrieved 1 January 2010. ^ Murray and Pullar (1910) "Lochs of Lewis" Page 208, Volume II, Part II. National Library of Scotland. Retrieved 20 December 2009. ^ See this photograph: "Saltwater Dam" Geograph. Retrieved 1 January 2010. ^ This dùn is probably the remains of a broch. See "South Uist, Eochar, Dun Na Buail' Uachdraich" Archived 2011-07-19 at the Wayback Machine Archived 2011-07-19 at the Wayback Machine Scotlands Places. Retrieved 15 December 2009. ^ "Perth" Gazetteer for Scotland. Retrieved 29 April 2010. ^ Gilvear D. J., Davies J. R., and Winterbottom S. J. (1994) "Mechanisms of floodbank failure during large flood events on the rivers Tay and Earn, Scotland" Quarterly Journal of Engineering Geology and Hydrogeology. Geological Society of London 27 issue 4. pp. 319-332. Retrieved 29 April 2010. ^ Gilvear, David J. (1993) "River management and conservation issues on formerly braided river systems; the case of the River Tay, Scotland". Geological Society. London. Special Publications 75 pp. 231-240. Retrieved 29 April 2010.